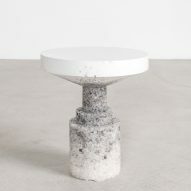 New York designers Anna Karlin and Fernando Mastrangelo have collaborated on a limited-edition set of tables that blends their two styles. 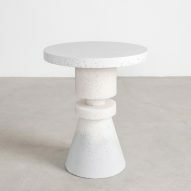 The Chunk series combines the geometric shapes of Karlin's Chess Piece collection of stools with Mastrangelo's sand-casting technique and pastel tones. 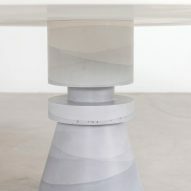 The result is a range of five table designs, each with a unique totem-like form and a varied, gradient surface. 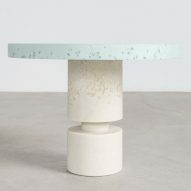 All have a different-sized circular top and stacked base, from a large dining table to a small side version. 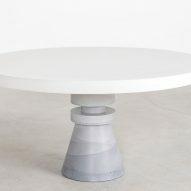 The largest has a pale top and a mid-grey support, while the smallest features a white slab and a speckled column that blends from dark to light grey. Others include an all-black design and one with a pale green top. 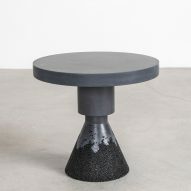 Mastrangelo took Karlin's designs – originally released in steel, wood, and brass – and cast them from a mix of cement, salt, glass, quartz, and silica. 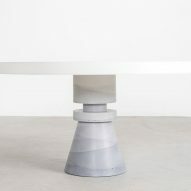 He has previously used the technique to create furniture pieces and partitions at a fashion boutique. "I've always admired Anna's versatility and range as a designer, and this collaboration was a natural extension of our two studios," said Mastrangelo in a statement. "The chess pieces presented the opportunity to apply my distinctive range of materials and visual language." 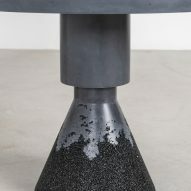 "Exploring the tension between the natural and the man-made has always been central to my work," added Karlin. "The collaboration with Fernando has allowed me to revisit my chess collection and manifest them in a new vocabulary inviting a new context for the work." 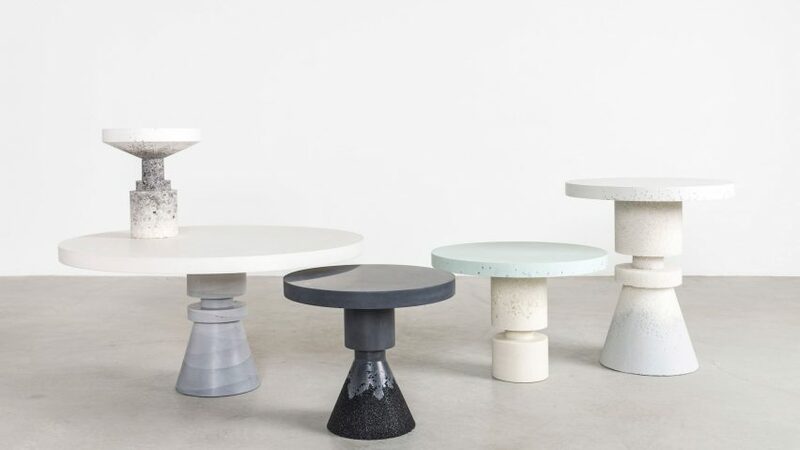 The five designs are each available in an edition of eight, and were showcased this month at Karlin's recently opened studio at 108 Eldridge Street, in New York's Lower East Side neighbourhood. The display coincided with the NYCxDesign festival, which took place 11-23 May 2018 and included presentations across the city.